W2MEDIA.ORG | Media Mornings independent Canadian news hour on Vancouver Co-op Radio 100.5 fm LIVESTREAM (during 7-8am PST). Podcast available at 8amPST. We discuss this Montreal-based artist’s new project confronting issues of refugees. 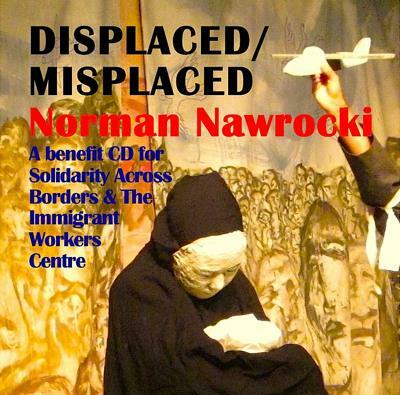 The compassionate and timely 18 track, 55 minute spoken word / music opus tells stories of refugees, migrants, immigrants, temporary foreign workers and those forced to leave their homes because of war, poverty, climate change, racism, persecution, violence, fascism, etc. Since 1986, Nawrocki’s musical legacy is 29 albums both solo and with his many bands (Rhythm Activism, Bakunin’s Bum, Crocodile!, Wild Plains, etc. ), plus 34 compilations. His last album was Heavenly Devils (LPN 2016) with his East European-flavoured ensemble, DaZoque! 30:00 Investigative journalist Bob Mackin of The Breaker speaks at a panel on the role of independent media in this provincial election. 50:00 Soldiers of Odin (SOO). After a debacle at last Sunday’s anti-racism rally in Vancouver, where rightwing extremists used a smoke bomb and sought confrontation, we explore SOO tactics, ideas and roots.